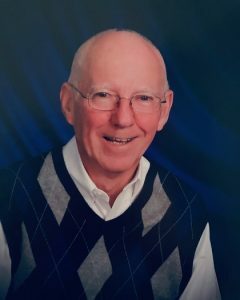 Clarence Edwin “Frog” Wilson of Campbellsville, son of the late Lucy Kathryn Thomas Wilson and Clarence Edwin Wilson Sr., was born on March 14, 1942 in Taylor County, Kentucky. He died at the age of 76 on Wednesday, March 6, 2019. He professed faith in Christ and was a lifelong member of Campbellsville Baptist Church. Frog was the last owner of the Caulk Hardware Store in Campbellsville. He started working for Leland and Willard Caulk as a teenager. Frog was on the board of the Lake Cumberland Area Development District, was a member of the Downtown Business Association, and was honored as Small Business Person of the Year by the Taylor County Chamber of Commerce. Frog was a warm-hearted, generous man who was beloved by his community and was a friend and mentor to many who knew him. As the local Honda motorcycle dealer, he sponsored racing teams and brought joy to many central Kentucky young people. He also coached girls’ softball and later in life became an avid house-boater. Frog united in marriage with Ruth Ann Gaddie of Greensburg on June 1, 1962. Besides his wife, he is survived by his son, Dr. George Edwin Wilson and his partner, Jacob Bonynge of Winter Park, Florida; by his daughter, Kathy Ann Wilson of Campbellsville; and by his cousin, Lana Carol Houk of Greensburg and her husband, Dale. In addition to his parents, Frog was preceded in death by his aunt and uncle, Ethel and Robert Wilson; by his wife’s parents, Corrinne and George Gaddie; and by his sister-in-law, Betty Gaddie.